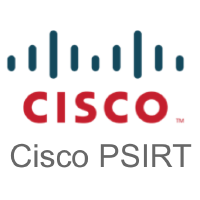 My buddy Omar Santos from the Cisco PSIRT team recently posted on the Cisco blog about the Shadows Brokers release of various exploit code. There has been a ton of chatter about this so its great to see Omar’s quick response. The original post can be found HERE. The Cisco ASA CLI Remote Code Execution Vulnerability was addressed in a defect fixed in 2011. We have issued a formal Security Advisory to increase its visibility with our customers so they can ensure they are running software versions that defend against the exploit Shadow Broker has shared. 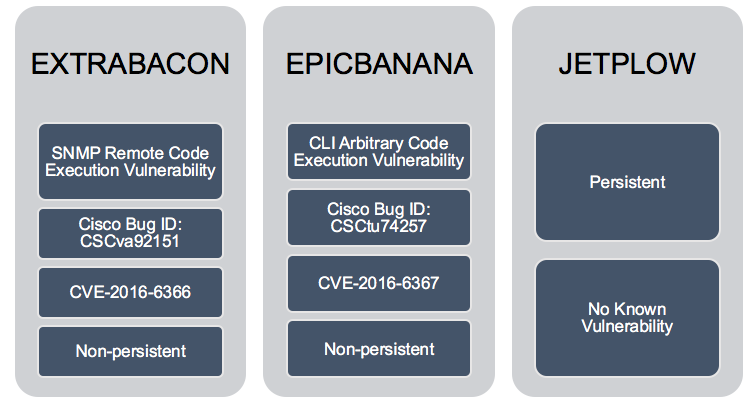 There were three references to exploits that affect Cisco ASA, Cisco PIX, and Cisco Firewall Services Module: EXTRABACON, EPICBANANA, and JETPLOW. The following figure lists each exploit and related vulnerabilities. The EXTRABACON exploit targets a buffer overflow vulnerability in the SNMP code of the Cisco ASA, Cisco PIX, and Cisco Firewall Services Module. Please refer to the Cisco Security Advisorydocumenting CVE-2016-6366 for a complete list of affected products. An attacker could exploit this vulnerability by sending crafted SNMP packets to an affected Cisco product. The following figure illustrates how the exploit works. SNMP must be configured and enabled in the interface which is receiving the the SNMP packets. In the example above SNMP is only enabled in the management interface of the Cisco ASA. Subsequently, the attacker must launch the attack from a network residing on that interface. 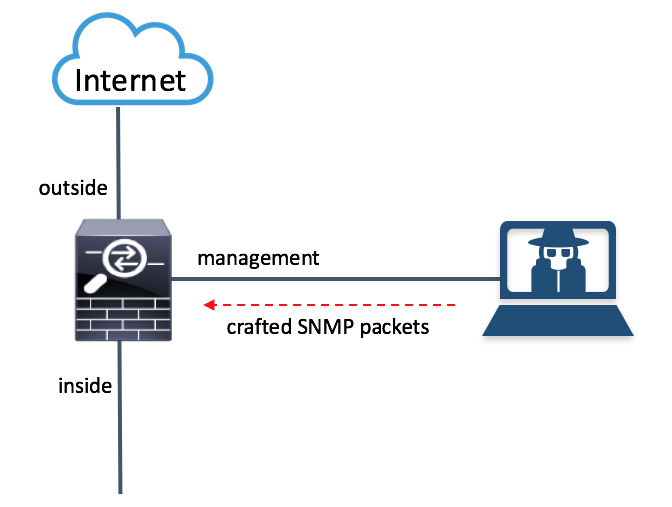 Crafted SNMP traffic coming from any other interface (outside or inside) cannot trigger this vulnerability. The SNMP community string needs to be known by the attacker in order to exploit this vulnerability. Only traffic directed to the affected system can be used to exploit this vulnerability. This vulnerability affects systems configured in routed and transparent firewall mode only and in single or multiple context mode. This vulnerability can be triggered by IPv4 traffic only. All supported versions of SNMP (v1, v2c, and 3) are affected by this vulnerability. This exploit could allow the attacker to execute arbitrary code and obtain full control of the system or to cause a reload of the affected system. All Cisco ASA Software releases are affected. You can configure the Cisco ASA and any other firewalls to send SNMP traps, which are messages from the managed device to a network management system (NMS) for certain events. You can also use the NMS to browse the MIBs on the firewall. SNMP uses two fundamental concepts Management Information Base (MIB) and Object Identifier (OIDs). MIBs are a collection of definitions, and network devices such as firewalls, maintain a database of values for each definition. Browsing a MIB means issuing a series of GET-NEXT or GET-BULK requests of the MIB tree from the NMS to determine values. The Cisco ASA and other firewalls have an SNMP agent that notifies designated management stations if events occur that are predefined to require a notification. For instance, when a link in the network goes up or down. The notification it sends includes an SNMP OID, which identifies itself to the management stations. The firewall SNMP agent also replies when a management station asks for information. As mentioned earlier, in order for this exploit to be successful the affected device must be configured for SNMP with the snmp-server enable command. In the following example, I am launching the exploit against the management interface (which has SNMP enabled) to a Cisco ASA in the lab (192.168.1.66). The ASA was configured for SNMPv2 with the community string of “cisco”. [+] 0000 30 82 01 6F 02 01 01 04 05 63 69 73 63 6F A5 82 0..o.....cisco..
[+] 0010 01 61 02 04 19 59 85 21 02 01 00 02 01 01 30 82 .a...Y.!......0. [+] 0040 2F 00 00 00 5E EB EC E8 F8 FF FF FF 55 31 C0 89 /...^.......U1..
[+] 0050 BF A5 A5 A5 A5 B8 D8 A5 A5 A5 31 F8 BB A5 25 AC ..........1...%. [+] 0080 A4 E9 2F 00 00 00 5E EB EC E8 F8 FF FF FF 55 89 ../...^.......U. In my example, I launched the exploit against a Cisco ASA 5506 running version 9.4(1). The exploit caused the ASA to crash with the following traceback. 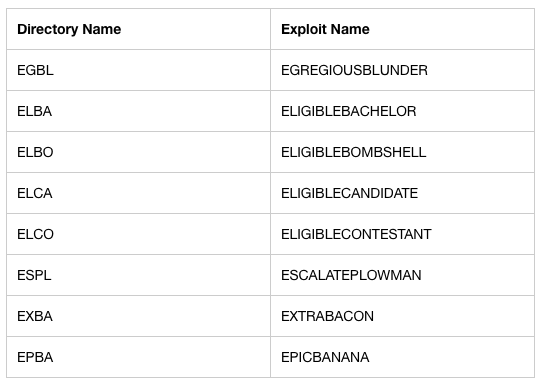 The EPICBANANA exploit leverages the vulnerability documented in CVE-2016-6367 and could allow an authenticated attacker to create a denial of service (DoS) condition or potentially execute arbitrary code. An attacker could exploit this vulnerability by invoking certain invalid commands in an affected device. The attacker must know the telnet or SSH password in order to successfully exploit an affected device. The vulnerability (CVE-2016-6367) leveraged by the EPICBANANA exploit has been fixed since Cisco ASA version 8.4(3). The EPICBANANA malware has built in functionality to connect to an affected device via telnet or SSH. The attacker must source the attack from an IP address that is allowed by the ssh or telnet commands in the Cisco ASA. This is why it is a best practice to only allow SSH or telnet connections from trusted sources and on certain interfaces only (such as the management interface). The EPICBANANA malware leverages Pexpect, which is a Python module for spawning child applications and controlling them automatically. Pexpect is typically used for automating interactive applications such as SSH, FTP, Telnet, and others. Pexpect can be used by users to a automate setup scripts for duplicating software package installations on different servers. JETPLOW is a persistent implant of EPICBANANA. Digitally signed Cisco software is signed using secure asymmetrical (public-key) cryptography in newer platforms prevents these types of attacks. The purpose of digitally signed Cisco software is to increase the security posture of Cisco ASA devices by ensuring that the software running on the system has not been tampered with and originated from a trusted source as claimed. Cisco Secure Boot also mitigates this issue. Cisco Secure Boot is a secure startup process that the Cisco device performs each time it boots up. Beginning with the initial power-on, special purpose hardware verifies the integrity of the first software instructions that execute and establishes a chain of trust for the ROMMON code and the Cisco ASA image via digital signatures as they are loaded. If any failures are detected, the user is notified of the error and the device will wait for the operator to correct the error. This prevents the network device from executing compromised software. This document describes ways to verify that the software on a Cisco firewall running Cisco ASA Software, both in device storage and in running memory, has not been modified. Additionally, the document presents common best practices that can aid in protecting against attempts to inject malicious software (also referred to as malware) in a device running Cisco ASA Software. This document applies only to Cisco ASA Software and to no other Cisco operating systems. This document does not apply to any of the service modules running within the Cisco ASA device. Next Next post: The Shadow Brokers: Lifting the Shadows of the NSA’s Equation Group?